A: The drummer is drooling from both sides of his mouth. 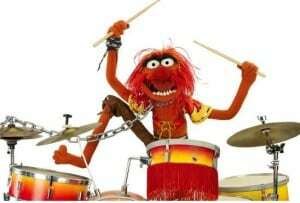 The old stereotype that drummers are just up on stage beating on stuff is tired and just simply wrong. You won’t have any trouble finding drummer jokes circulating the internet either. Those that play the drums know well that they are in fact “percussionists.” But what so many people fail to realize is that learning the craft of percussion, and more particularly the drum set is truly remarkable and highly artistic. The skills needed to play the drums are a certain amount of coordination and independence from each different limb of the body. Imagine doing something completely different with each foot and each hand! The integration of each different drum simultaneously, not to mention locking-in a steady and consistent speed makes most people dizzy. Now add the added need to listen and be aware of the rhythmic concepts other instruments in a band are playing and trying to integrate and compliment those as well. But that’s not all! Percussionists that play the drum set have to be well versed with different types of sticks that will produce different types of sounds (not to mention the fact that striking the drum in different places, sometimes just a half inch or so apart can produce a totally different sound.) It’s the person playing the drum set that first establishes the style, tempo, volume level and total feel for any piece of music. Even basic drum lessons teach coordination skills, music reading, leadership (yes…leadership) skills and so much more! Those that teach drum lessons know their craft forward and backward. They’re not just teaching someone to use drums as a noisemaker. They’re teaching students to channel their energy into something both technical and incredibly artistic. They teach discipline, help students develop their ear by listening to so many other instruments and understand the melody as well as the rhythm. So where else can you get occupational therapy skills, sharp refinement both sides of the brain, development of listening skills and life coaching all lumped into one? Plus, you have to admit that it just looks down right cool. But beyond the cool, hidden in taking drum lessons and learning an instrument like this, comes the refinement of some of the most important parts of the brain. The next time you hear that the drummer got drool on his IQ test, you can realize that it’s just an old and outdated stereotype that no one believes any longer. Parents today seek out drum lessons for their child, not just to release tension, but to develop their mind as well as their body. So just remember to treat the drums with some added respect, the next time you see someone playing. Understand that they have skills that many others only dream of, and most likely have an intellect to match.